Reduce MP3 file size without losing quality on Windows/Mac. 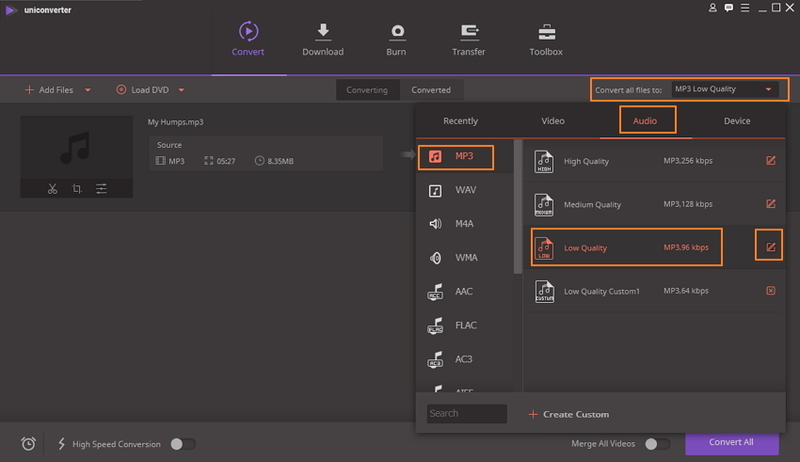 Compress audio/video files by adjusting bit rate, frame rates, encoder, format, etc. Download videos online to MP3 directly by pasting URLs. Transfer MP3 music between computer and phone devices easily via a USB cable. Reducing the size of MP3 audio files means creating extra space on your devices to accommodate more audio files. File storage and management are among the major issues for all the music enthusiasts, DJs, podcasts producers, and musicians. In such situations, the role of MP3 compressor becomes important. 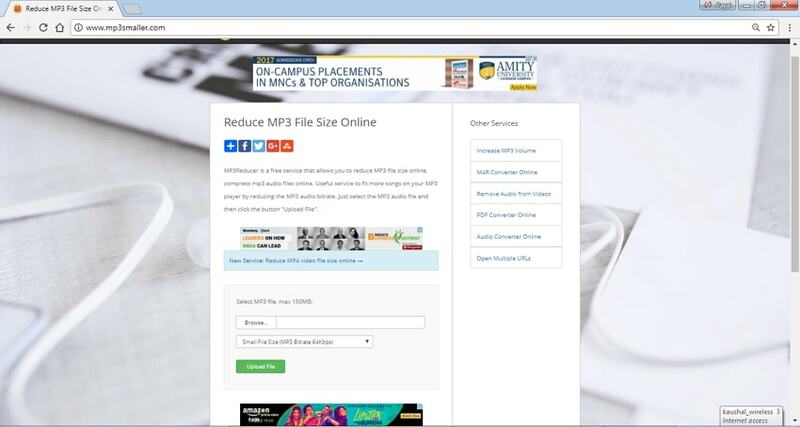 There is a list of options available when you want to compress MP3 online as online tools are always free and easy to use. Depending upon your requirements, you can pick the best suited MP3 size reducer no matter it is online or desktop. So if you are in search for the best ways on how to reduce MP3 file size, read below to get detailed information. Online MP3 reducer is simple and convenient tools to use, but they come with their share of limitations. Since the majority of these tools are free to use, they support a limited number of files and size and have no additional features. So if you are looking for a professional solution that performs better than those online tools as an alternative, Wondershare MP3 Reducer will prove to be a good option. It not only supports reducing MP3 file size without quality loss, but provides an array of features as a complete video toolbox. Compress MP3 and other 1000+ audio files with super fast speed and no quality loss. 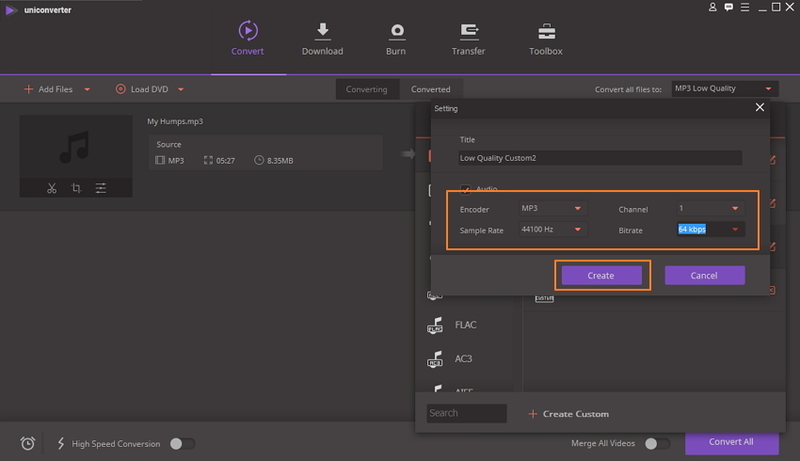 Reduce MP3 file size by changing bit rate, sample rate, encoder, channel and other parameters. Transfer compressed MP3 files from PC/Mac to Android/iPhone devices easily via a USB cable. Download YouTube videos and playlists to MP3 directly by pasting URLs. Convert videos to MP3 and vice versa within 3 simple steps. 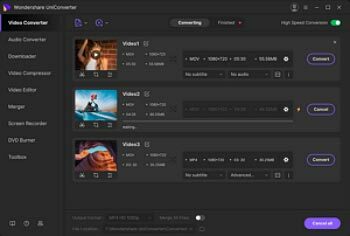 Versatile toolbox combines fix video metadata, GIF maker, cast video to TV, DVD burning, and screen recorder. Install and launch Wondershare UniConverter (originally Wondershare Video Converter Ultimate) on your PC/Mac first, then click on the +Add Files button under the Convert tab to browse for your desired MP3 files (you want to reduce in size) from local computer. Click the button beside the Convert all files to: option and go to the Audio > MP3 to select the Low Quality option. You can select other audio format here if you want to change the format. To further optimize the MP3 parameters, you can either click the Edit icon or the +Create Custom button to get the Setting window, where you can change the number of Encoder, Channel, Bitrate, Sample Rate. Once all settings are done, click on the Create button to proceed. Now you can easily tell the file size changes just as the screenshot shows, hit the Convert All button to start reducing MP3 size immediately. Upon successfully reducing MP3 file size, the file can be checked and managed under the Converted tab. MP3Reducer is a free online MP3 compressor that works by reducing MP3 audio bit rate. The program has simple to use interface, where you just need to add the MP3 file, select desired quality output file defining Bitrate. Maximum of up to 150MB files can be uploaded over the program. No need for registration or installation. Quickly reduces MP3 file size by reducing bit rate. After a few hours, the uploaded files are automatically removed. This is another online app that is free to use and helps to reduce the size of MP3 online. The app supports an array of formats and support file conversion as well. Once the audio files are added to the app, its quality, number of channels, bit rate, frequency, and other parameters can be changed to shrink its size. It also allows removing a voice from the audio track. To ensure the safety of your uploaded files, they are automatically deleted after a few hours from the servers. Free to use app without any need for installation. Support batch processing of files. Allows converting files to other formats. Provides tag support by changing the name of the track, album year, artists name and other details. Garyshood Music Convert is a free online MP3 compressor and a converter that performs the very basic function. Maximum of up to 8MB of audio can be added to the program and max bit rate supported is 256kbps. The program supports the majority of the sound formats including MP3, WAV, AAC, AIFF, and others. No need for any registration and installation. The max audio size is 8 megabytes. Supports the maximum bit rate 256kbps. ezyZip is a decent online compression tool that also works as a great MP3 shrinker online, The program allows zipping and unzipping files as needed. Uploading or downloading files to the server is not needed on ezyZip as it runs as a HTML5/ja_x_vascript app locally in your browser. The process of shrinking files is very fast using the tool. Once the files are archived you can save them to your local drive. Free to use online program. Allows zipping and create archive of files. 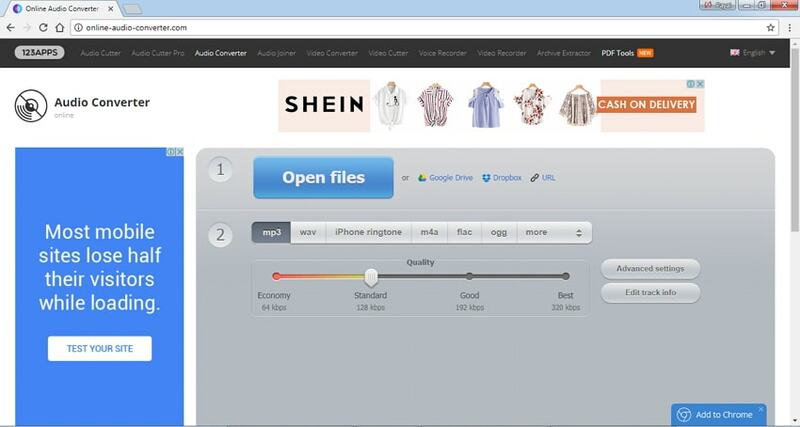 Online Convert is a free tool that converts your files to the Zip format. The program allows adding the file directly or by providing its link. Additionally, files can also be added from Dropbox or Google Drive. Password protected archives are not supported by the program. Online Convert also allows converting an archive to another compressed archive. Once the files are zipped they can be saved on local PC. No need for any registration or installation. Support adding file links, files from Dropbox and Google Drive in addition to local files. Archives can be converted to other compressed archives. Above listed are professional software and top 5 online MP3 file compressors. Selecting one of the 6 programs entirely depends upon your use and requirements. To make the selection process a little easier, the comparison of the above listed 6 methods is given in the table below. 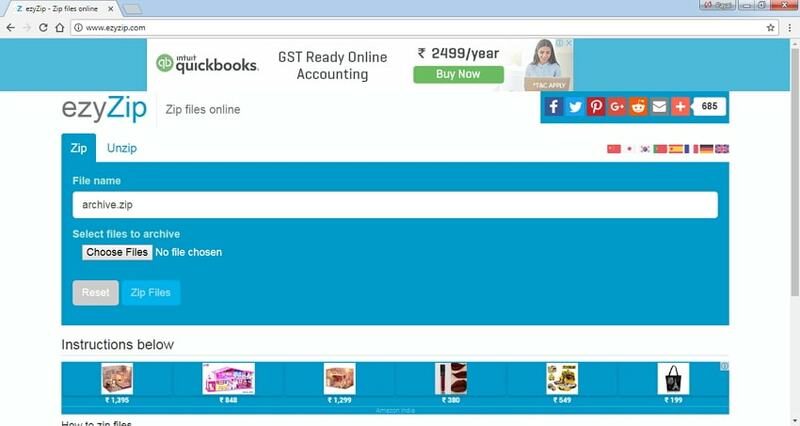 Know your needs and select the best-suited method. 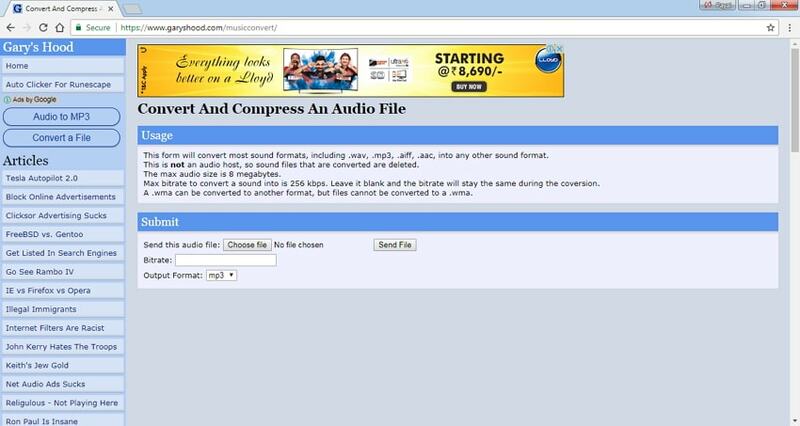 We ensured to clear all your doubts and queries on how to compress MP3 files with the above article. Shrink your files a little and create an extra space to add some more of your favorites.